First off, elmo, I see you are still killing crustaceans with reckless abandon. Cad! Anyway, the soup looks delicious and I am jealous. Soup like that sees its heyday in Phoenix about once a year when we have a frosty dip in the temperature as the thermometer plunges to a frigid 50 degrees. Brrrr. Otherwise, it is just too hot in Phoenix to enjoy it without having to wring out our buttondown Oxford cotton dress shirt before returning to work. I shall endeavor to live vicariously through your soup travels, however. "Lip-smackingly" delicious post! Your words made me warm inside. When I am cold in the bay area, I am just going to read this post again, rather than getting myself a bowl of hot soup. This post is infinitely more satisfying. Noodle soup is definitely something I have to my fill of before it gets too hot. 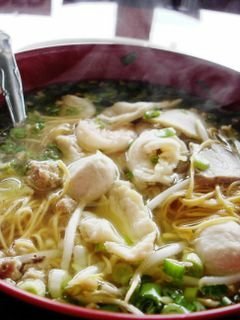 I perspire at the sight of a chili pepper, so anything like noodle soup would put me over the edge too in balmy weather. Aw thanks! But I'd be constantly full of noodle soup if I lived in such a brisk climate as the Bay Area...my kind of weather! I can't confirm it, but the noodles I had are, I think, better known as Chiu Chow style. 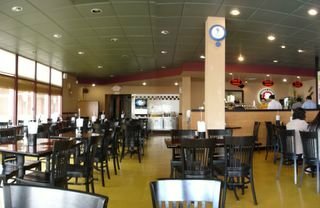 The place is owned by Vietnamese and serves stir fried dishes in sort of a Vietnamese-influenced Chinese/American cuisine. The noodle soups are probably the most authentic items on the menu though. Yeah, almost always empty when I go too. But this time, it was raining, and man, it was packed...okay "packed" is the wrong word...the place was 1/4 filled to capacity. Okay 1/6. So here I thought I was safe from hunger pangs reading you after I ate dinner. As soon as I saw that glorious bowl of soup pop up, my mouth instantly salivated. The description of your meal made it non-stop. In spite of our now, sunny skies and warmer temps, a bowl of soup still sounds amazingly comforting. Have you tried their fried cream cheese wontons? We love them! But the dipping sauce is too thin. Thanks Elmomonster for the rec. I have always thought OC to be a culinary wasteland (as quoted from CH) but your blogs always give me hope. I'm always in the mood for good Asian food and I figured I would only get it going towards SGV or battling the 22 to get to Little Saigon. I hope to visit Noodle Avenue very very soon! Thanks again! I've avoided ordering the fried cream cheese wontons, but I think I may have to try it the next time I go. Hear that sound? That's the sound of my arteries hardening. Thanks for dropping by! The Noodle Soup is definitely what you want to be ordering. My friend ordered the Beef Crispy Noodle and he said it was bland. I told him he should've stuck to the Noodle Soups. Cheaper too! the OG restaurant is in westminster and it's called Trieu Chau off of westminster and brookhurts. The same owners. At the original location you can get a combination of noodle types with the house special and they don't charge you extra! the tustin one is still good. That's it! Trieu Chau, I knew this Tustin branch is an offshoot of something more popular in Westminster. Just couldn't put a finger on what it was. Till now! This noodle haven is air conditioned and super clean and cheap and soooooooooo good and filling and has so many choices. Go check it out on Redhill Blvd just north of the 5 fwy. the roast duck noodles are super! Elmo's review was great, but you all should read this one for the full effect: http://www.ocweekly.com/food/this-hole-in-the-wall-life/this-hole-in-the-wall-life/25035/ He's right about the green curry soup--have it with udon, it's my favorite, too! I moved out of OC a year and a half ago to a place that doesn't have asian food. Noodle Avenue is the first place I crave when I land on the west coast. I take pictures of the bowl of noodles just to adore when I fly away. Here's one of my favorite toppings: Over by the soda fountain, there are green chiles in vinegar. If you dip the meatballs or shrimp into this sauce, it is SOOOO good. P.S. - Do any of you remember a Chieu Chau noodle place in Santa Ana or Tustin that was big, dark, dingy, and ALWAYS had christmas tinsel up? I'm not sure if they've close or are still open. I'm proud to say my friend's dad owns this place. The House Noodle really is delicious - I always choose the wide rice noodle. Very filling. Be sure to try the eggrolls; they are delish. This is awesome! I'm always on the lookout for cool places for noodles. Thanks! The food is OK. However, you got to start taking credit cards with no minimum charge. Sorry to stereotype but stop being so Chinesse! Pay taxes like the rest of the American and Mexican restaurants!! I believe the place has already closed down. I hate to say it, but I can't really say its that big of a loss. The food was just okay, and never anything really special.